Welcome to Pink Lemonade's Weight Loss Wednesday! We all know that exercise is a vital component of any weight loss program... but if you're anything like me, you find traditional exercise boring and redundant. I have been searching for something that will be able to hold my attention while helping me keep fit and have fun... I think I've found it - and it's name is Wii Fit . You see, the main component of this "game" is a plastic board (akin to those step-aerobic boards of the 90's, only flatter), called the Wii Balance Board which acts as the game's controller. It registers players' movements as they're prompted to bend, flex and turn with the game. It will track your weight and BMI and even provide colorful charts and graphs to track your progress. When the Wii game system was first introduced, Wii Sports, which comes packaged with the game console, was all the rage in fitness. It features games such as tennis, baseball and boxing which do, actually, get your heat pumping at a pretty rapid pace if you're playing the game as if you were really there. Websites touting Wii Sports' weight loss capabilities popped up all over the net and, yes, even I bought into it. It was over the long run, however, that I found punching out a bobble headed Mii just didn't really hold much appeal, so I abandoned my quest for fitness with the Wii. 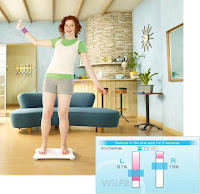 Until now... Wii Fit combines Yoga, Balance Games, Strength Training and Aerobics, all into a fun video game session. I am not a big fan of high impact, "in your face" kinds of exercise - I'm perfectly happy with a nice session of Pilates - but never get the time to get to a session. With the Wii Fit, I can snowboard, or walk a tight rope and then settle in for a nice session of Yoga. I'm so excited for the release of Wii Fit ! If you would like to see just how the new Wii Fit works without the investment, check out the Wii Fit Movement page and see where Nintendo will be bringing the Wii Fit to a festival near you, for everyone to try. I am hearing tons of great stuff about the Wii, maybe it is time I finally break down and get one! Wonder if this really works. It will work if you use it.